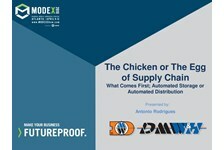 1) The Chicken or the Egg of Supply Chain ??? what comes first; Automated Storage or Automated Distribution? 4) Bricks ?? ?n Clicks ??? Retail is changing, are you changing with it?